This dish comes together in a snap, with almost no hands-on time, but feels pretty darn fancy. We serve ours on top of a whole-wheat grain such as barley, faro, or quinoa. Preheat oven to 425 degrees Farenheit. Place Brussels sprouts in an 8 x 8 inch baking dish and drizzle with evoo. Cover dish loosely with aluminum foil and bake for 15 minutes. Remove dish from oven. 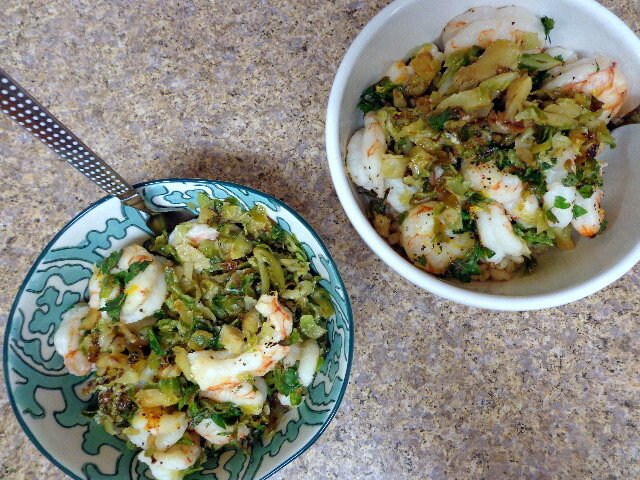 Top the sprouts evenly with shrimp, parsley, and lemon, and season with salt and pepper. Return to oven and bake, uncovered, for 12 additional minutes.